In the early 1800s, the English became concerned with the beauty of dogs as well as their function. This fad spread to North America, and in 1877, the Westminster Kennel Club Dog Show began. Soon after, the need for a regulating body became obvious. The National American Kennel Club, which had been founded in 1876, began to publish and make publicly available its studbook in 1879. This organization, however, had a more vested interest in field trials than in conformation shows, and eventually changed its name to the National Field Trial Association and stopped hosting conformation shows completely. In 1884, a group of 13 breed clubs, 10 American clubs and three Canadian clubs founded the American Kennel Club. These 13 clubs pledged "to do everything to advance the study, breeding, exhibiting, running and maintenance of purity of thoroughbred dogs." 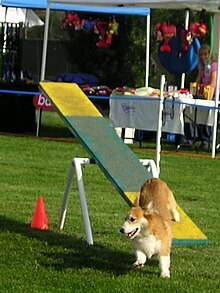 The AKC differed from The Kennel Club in that individuals could not directly join the Kennel Club; they became members of smaller, individual breed clubs, which were themselves members of the AKC. When arguments began to develop between the American and Canadian breed clubs in 1886, the Canadian clubs pulled out from the organization and established their own kennel club two years later, the Canadian Kennel Club. In 1894, the American Kennel Club began to refuse to allow Canadian dogs without an American pedigree to participate in its shows, following the prevailing trends in American purebred cattle organizations. In 1906, the U.S. Department of Agriculture ruled that any dogs imported to America who were not registered with the AKC would have to pay a duty charge; this was later changed in 1911, allowing any dog registered with a kennel club in its home country duty-free entry into the country. Soon after the AKC, CKC, and KC produced agreements that made any dog eligible to be registered with the club in its home country, eligible for registration in the remaining two clubs as well. In 1909, the group moved to New York and became incorporated. The AKC is the largest registry of purebred dogs in the U.S. and is the only not-for profit registry, as well as the most well-known and the most influential. For a purebred dog to be registered with the AKC, the dog's parents must be registered with the AKC as the same breed, and the litter in which the dog is born must be registered with the AKC. If the dog's parents are not registered with the AKC or the litter is not registered, an exception may be made if the AKC determines, through special registry research, that the dog is eligible for AKC registration. Once a determination of eligibility is met, either by litter application or registry research, the dog can be registered as purebred by the AKC. Registration indicates only that the dog's parents were registered as one recognized breed; it does not necessarily indicate that the dog comes from healthy or show-quality bloodlines, nor is registration necessarily a reflection on the quality of the breeder or how the puppy was raised. The AKC National Championship sponsored by Royal Canin, formerly AKC/Eukanuba National Championship, is an annual event held in Orlando, FL. The show is by invitation only. The dogs invited to the show have either finished their championship from the bred-by-exhibitor class or ranked in the Top 25 of their breed. The show can often be seen on major television stations. Another AKC affiliate is AKC Reunite, formerly AKC Companion Animal Recovery (AKC CAR), founded in 1995, which is North America's largest not-for-profit pet ID and recovery service. Another AKC affiliate is the AKC Humane Fund, which supports breed rescue activities, assists shelters that permit domestic violence victims to bring their pets and educates dog lovers about responsible dog ownership. The AKC has been criticized for the prevalence of genetic disorders in their dogs. As many as 25% of purebred dogs registered by the AKC has at least one hereditary genetic problem. These problems cost breeders and owners almost $1,000,000,000 in vet bills and lost revenues from stillborn pups. Some breed clubs, such as the U.S. Border Collie Club, resisted applying for AKC breed acceptance due to fears that doing so would be detrimental to the genetics of the breed they represent. The Cavalier King Charles Spaniel Club voted to reject AKC recognition in May 2000 due to the incompatibility of the breed club's no-sales-to-pet-stores rule, and the kennel club's requiring such sales. The breed club had such a rule to aid in the genetic health of the breed. These genetic issues have resulted in the emergence of "puppy lemon laws" in several U.S. states. These laws protect dog owners from genetic diseases that their breeder may have neglected to inform them of, allowing them to get a refund for the cost of the puppy or to force the breeder to pay their vet bills. The AKC supports some canine health research and has run advertising campaigns implying that the AKC is committed to healthy dogs, but the AKC's role in furthering dog health is controversial. Temple Grandin maintains that the AKC's standards only regulate physical appearance, not emotional or behavioral health. The AKC itself states that "There is a widely held belief that "AKC" or "AKC papers" guarantee the quality of a dog. This is not the case. AKC is a registry body. A registration certificate...in no way indicates the quality or state of health of the dog." The AKC has no health standards for breeding; the only breeding restriction is age (a dog can be no younger than eight months). Though the majority of the 170 breed-specific parent clubs have a health committee devoted to their breed's specific concerns, the AKC prohibits clubs from imposing stricter regulations since the AKC Rules Applying to Registration and Discipline apply to all breed clubs and do not provide an option for breed clubs to extend or override them. Thus, an AKC breed club cannot require a higher breeding age, hip dysplasia ratings, genetic tests for heritable diseases, or any other restrictions. Parent clubs have the power to define the looks of the breed, or the breed standard, and may also restrict participation in non-regular events or classes such as Futurities or Maturities to only those dogs meeting their defined criteria. These non-regular events can require health testing, DNA sampling, instinct/ability testing, and other outlined requirements as established by the hosting club. In summary, attention to health among breeders is voluntary and not mandated. By contrast, many dog clubs outside the U.S. do require health tests of breeding dogs. The German Shepherd Club of Germany, for example, requires hip and elbow X-rays in addition to other tests before a dog can be bred. Such breeding restrictions are not allowed in AKC member clubs. As a result, some U.S. breeders have established parallel registries or health databases outside of the AKC; for example, the Berner Garde established such a database in 1995 after genetic diseases reduced the average lifespan of a Bernese Mountain Dog to seven years. By comparison, the Swiss Bernese Mountain Dog Club introduced mandatory hip X-rays in 1971. For these, and other reasons, a small number of breed clubs have not yet joined the AKC so they can maintain stringent health standards, but, in general, the breeders' desire to show their dogs at AKC shows such as the Westminster Kennel Club Dog Show has won out over these concerns. Concern surrounding the AKC's connections to low-quality breeders has resulted in some dog owners seeking to distance themselves from the organization. In October 2012, Hailey Parker, a longtime Coton de Tulear breeder, filed a lawsuit (that was settled) against the AKC and cited the AKC's connections with high-volume breeders among the reasons. The Coton's “reputation and business model is based on a disassociation from ‘puppy mills’ and similar commercial breeding operations,” according to the complaint. The AKC does support several health research initiatives. The AKC Canine Health Foundation funded research that led to the mapping of the canine genome (DNA sequence) with grants totaling more than $2,000,000. Sequencing of the dog genome began in June 2003, funded in large part by the National Human Genome Research Institute (NHGRI) and finished the completed sequence of the entire dog genome at MIT's Broad Institute in 2005. Because people inherit many of the same diseases as dogs, humans can also benefit from health research funded for dogs. The AKC tracks all dog-related legislation in the U.S., lobbies lawmakers and issues legislative alerts on the internet asking for citizens to contact public officials. They are particularly active in combating breed-specific legislation, such as bans on certain breeds considered dangerous. ^ "The American Kennel Club: No longer 'The Dogs's Champion'" (PDF). Retrieved 7 October 2015.